On our second full day in Italy we went to visit two schools. 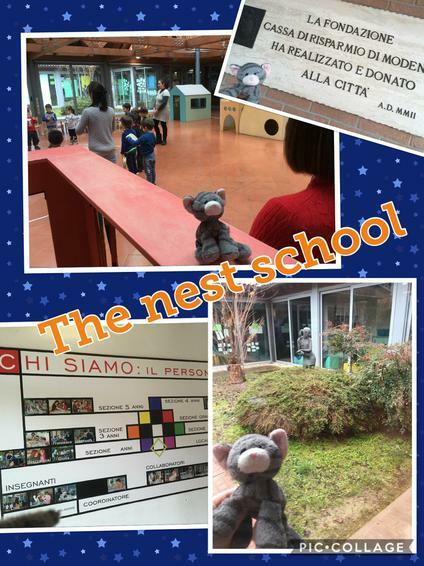 In Italy the first school pupils can attend are called Nest Schools. Pupils here are aged 0 to 6 years old and do not receive any formal teaching of literacy or numeracy. Some pupils have free places and some have to pay up to €250 per month. Pupils attend from 08:30 to 16:30 (or 07:30 if parents can prove they are working), as a result there is an hour in the afternoon put aside for a nap - Bob and I thought this was a great idea. The first nest school we saw was a beautiful, purpose-built building, full of light and natural materials. It had four inner courtyards that pupils could access via patio doors and celebrated the different seasons. It also had a large central hall with play .equipment the children could use in the morning in breakfast club and if it was raining. Bob and I were amazed how creative the young children were. From 3 years old they had sketch books. One example we were shown, was where pupils were shown lots of famous portraits and asked to draw their own on the first page of a large sketch book. Each week they explored a different feature of the face or method and were asked draw their face again on the next page. This gave a visual account of the child's learning journey. All pupils ate lunch in school and tables were laid by the pupils. They paid €5 each day for a two course meal of pasta and meat with bread rolls and fruit (this amount was subsidised by the authorities). In the afternoon we were challenged to complete a treasure hunt around Bologna. Our team trekked around the famous landmarks until we reached the final destination - an Italian ice-cream shop! I can strongly recommend the chocolate hazelnut and the coffee ice-creams.